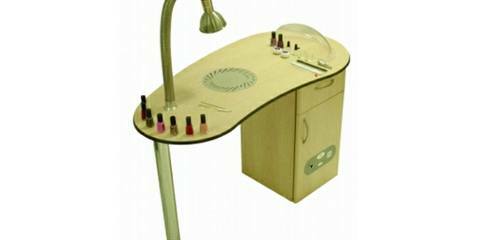 The job of nail tech poses a few special challenges when it comes to your health. The good news is, little changes go a big way toward ensuring a long and healthy career. 1. Pay attention to the ergonomics at your workstation. Position your chair, table, tools, and even your client to keep stress on your body to a minimum. When you work on manicure clients, take care that you can bend your arms at roughly a 90-degree angle with your forearms parallel to the ground. The chair’s backrest should support your lower and middle back. When pedicuring, make sure you don’t have to hunch over or reach too far to meet the feet. 2. Handle little aches before they become big pains. If the awkward reaching and repetitive motions that go with the job are starting to take a toll on your body, stop right now and see a physician, chiropractor, or physical therapist for diagnosis and treatment. Ask your doctor to recommend a stretching or exercise routine. 3. Schedule a lunch break and take it. Eat a well-balanced meal and, if you have time, follow it with a walk outdoors. If the weather’s no good, try walking at the mall. 4. Wash hands thoroughly before and after each service, and before eating. This reduces the likelihood you will develop a product allergy. It also makes it less likely you’ll catch every cold and flu that’s going around. 5. Use a clean or disposable towel for each customer. This also reduces the likelihood of you (or your client) developing a product sensitivity. Wearing disposable nitrile gloves is also an effective precaution. 6. Take the time to stretch between clients. Start by gently rolling your head and circling your shoulders. Take pressure off the spine by bending at the waist and rolling up slowly. Ease tension in the wrists by rotating them inward and outward several times. Finally, rub your hands together briskly and place them over your eyes for a few seconds. When you’re done, look around, focusing on both near and far objects. 7. Watch for signs of sensitivity or allergic reaction. If you notice red, swollen, dry, itchy, or cracked skin, see a doctor immediately. Don’t be afraid to deal with the problem; even if you have developed a sensitivity, it’s possible to change products and work habits and get back to work. 8. Practice healthy work habits. Keep products in smaller-sized, properly labeled containers at your workstation. Keep nail containers closed when not in use. Never pour more liquid into your dappen dish than is needed for the type of application you are performing. Keep a metal trash can with a self-closing lid near your workstation. 9. Ensure adequate ventilation. Capture vapors and dusts at their source with a local exhaust system. Vented tables are one type of local exhaust system; others are wall- or ceiling-mounted. You also need general room ventilation — meaning a professional-quality HVAC system — to ensure high-quality air in the salon. Ideally both these systems should vent outdoors. 10. Learn to say no. Having more clients than you can handle may sound like a good thing, but it’s a stressor that leads to overly long days. Maintain balance between your work and home life by sometimes saying no to clients’ requests. If you genuinely have too many clients, consider raising your prices or working with an assistant.